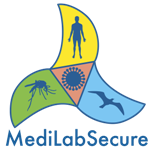 The MediLabSecure project includes the creation of a sub-network of animal virology laboratories. 18 laboratories have already been selected to take part in this network, as shown in the map below. By clicking on the Icon at the top left corner of the map, you will be able to select the Network you want to display on the Map (Animal Virology for example). Untick to hide.